Another basic needs mod. No thirst or whatever — hunger and tiredness only. No new items. No vanilla items changed. No schedules — your character just has to eat or sleep whenever he gets hungry or tired. Works with Tamriel Rebuilt food and beverages too. MWSE Nightly build required. v 2.1e — fixed some issues with basic needs of vampires, werewolves and prisoners. v 2.1b — food consumption works now correctly after save/load. v 2.1a — fixed some issues with TR ingredients not being considered as food. Skooma and moon sugar decrease tiredness now. Some issues are fixed (e. g. you can consume food from container, not only from your inventory). Tamriel Rebuilt support included to the main mod package. No new items and all vanilla items unchanged. Hunger and tiredness penalties may seem to be too strong, but they make food and rest really necessary. Vampires and werewolves (in wolf form) don't get hungry or tired. Imprisoned characters don't get hungry or tired. Your character must eat appr. 3 units of food every 5 hours or after 8 hours of sleep. (You can adjust the amount in the mod config menu.) The more hungry your character gets, the more food it has to eat. While staying hungry, it will suffer penalties and eventually die. + All vanilla beverages are food now. Drain attributes: Agility, Endurance, Strength and Speed — from 10 to 100 pts. Drain Fatigue (varying quantity in different hunger stages). Drain Health (in terminal hunger stages). Instant death (after 260 hours of hunger). Your character must rest appr. 9 hours everyday. (You can adjust the amount in the mod config menu.) The more tired your character gets, the more rest it must have (but not much more). While staying tired, it will suffer penalties and eventually die. 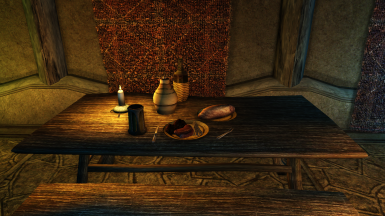 + Your character can also eat moon sugar or drink skooma being tired. One item consumed equals 2 hours of sleep. Drain attributes: Intelligence, Personality, Willpower, Luck — from 10 to 100 pts. Drain Fatigue (varying quantity in different tiredness stages). Drain Magicka (in terminal tiredness stages). Instant death (after 160 hours of tiredness). Ket's Tired and Hungry - Economics — makes all food cost from 10 s. to 25 s., and makes room rent cost 50 s. Highly recommended.